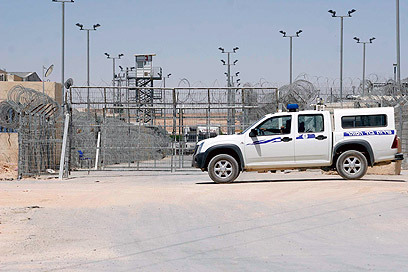 Eritrean asylum seekers in the Saharonim detention facility have declared a hunger strike Monday, in protest of their detention without trial. According to the Israel Prison Service, 130 of the 300 hunger-strikers ended the hunger strike Thursday. According to Amnesty Israel, however, 350 out of the 2,000 detainees in the Saharonim facility were still under hunger strike. The IPS defines a hunger strike when a detainee is sending meals back for over two days. Amnesty activists said that the striking detainees were demanding to meet with government representatives and be recognized as refugees. "Despite recurring requests to speak with government representatives, the facility failed to transfer our requests," said H., a detainee in the facility, to Amnesty Israel. "We are physically weak, but stand strong and united. We have no other choice." Following the hunger strike, the Israel Prison Service decided to remove all food products that the infiltrators kept in the cells, and deprived them of privileges. Jonathan Ger, CEO of Amnesty International Israel, said, "The Saharonim hunger-strikers know that being sent back to Eritrea would sentence them to imprisonment, prosecution and sometimes even death. "The Eritrean government views everyone who seeks asylum in another country as a traitor, and asylum seekers, as well as citizens suspected of opposing the government, face a risk in returning to Eritrea," Ger added. Meanwhile, Attorney General Yehuda Weinstein approved the legality of the procedure for the voluntary return of Eritrean and North Sudanese infiltrators who are held in custody and wish to return to their homeland. The procedure is intended to ensure that when a person is held in custody, it is ascertained whether he or she desires to return to their homeland by their own free will. See all talkbacks "Saharonim detainees go on hunger strike "